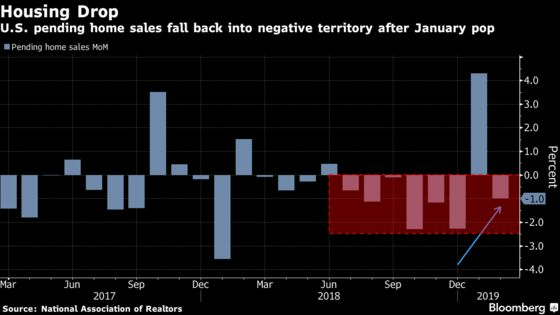 (Bloomberg) -- Contract signings to purchase previously owned U.S. homes fell more than estimated in February, suggesting that the prior month’s surge resulted from pent-up demand and that a sustainable recovery may take more time. The data add to a mixed picture of the U.S. housing market, which has struggled with elevated prices and limited supply. A separate report this week showed new-home groundbreakings fell in February by the most in eight months, while other data indicate existing home sales rebounded last month to the best pace in almost a year. Even so, rising wages and lower mortgage rates are likely to support demand for homes in coming months, along with the Federal Reserve’s pledge to remain patient on raising borrowing costs. Pending sales were mixed regionally, rising in the South and West as the Northeast and Midwest saw declines. Pending-home sales are often looked to as a leading indicator of existing home sales, which make up 90 percent of the market. Since sales are counted once a deal closes, the measure can be a good gauge of the health of the housing market in the next couple of months.